Autodesk FormIt for Android Did Reality Capture Workflow Just Get Easier? This one has been on my radar for a few weeks but I just haven’t got around to posting about it. 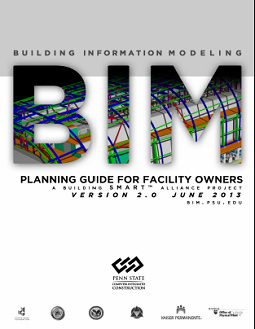 Penn State University, well known in BIM circles for producing comprehensive documentation, have updated their BIM Planning Guide for Facility Owners. Version 2.0 was published in June and is available from the Penn State website after providing your contact details. For further information about this guide visit the Owners page on the Penn State website. While it is a detailed document, it isn’t a one stop solution, and prepare yourself for a long read! This is an area where we are lacking clear guidance in Australia, and at ALL of the BIM events that I have attended over recent years it is clearly apparent that client education is the key to the successful implementation of BIM. After all, clients are in the unique position to demand that certain technology is used for delivery of their projects. At the moment there are far too many missed opportunities! Mind you it’s even worse when it goes the other way and clients appoint uneducated consultants as BIM managers, who produce BIM Execution Plans that are completely irrational (Full BIM please!) and simply don’t add value for anyone involved in the process, including the client. Hopefully work being done by buildingSMART in conjunction with the industry, along with projects under way by several other professional groups, will fill in some of the missing gaps? betterRevit is striving for better client awareness!